New York winters can be hard on your plumbing. 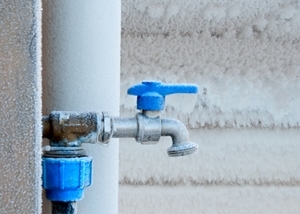 Sub-freezing temperatures cause water to harden and pipes to burst. When this happens, contact Bluewater Plumbing, Heating, and Air Conditioning. We offer prompt arrival and fast frozen pipe thawing in Queens and nearby for all residential and commercial properties. We fix all types of plumbing systems including metal and PVC pipes. Pipes that are exposed to cold will freeze if not properly insulated or protected from the environment. Pipes burst because of the pressure of the frozen water and the expansion involved. When water freezes inside a pipe, it expands in volume, which means it has no where to go but out if it's located in your water pipes. In addition, mold or mildew will develop around your plumbing due to loosened connections. You may also experience leaks around the plumbing. We utilize state of the art equipment and technology that makes it easier to locate and detect plumbing problems so you aren't stuck with the extra expense of paying a Queens plumber to dig around the ground or underneath foundations unnecessarily. This is particularly important when it comes to thawing frozen pipes in New York. For the best in plumbing solutions that include the proper location and detection of your frozen pipes, you'll want to call on our plumbing pro's at Bluewater Plumbing, Heating, and Air Conditioning Frozen pipe thawing is one of the common services we perform everyday, so you can be sure of our ability to provide you with experienced technicians who are skilled experts at frozen pipe thawing in Queens and the surrounding areas of New York. We also assist you with professional underground pipe location services that inform you of the location of all your plumbing routes and any issues you may be having underground. We work with everything from septic systems, to complicated plumbing networks in businesses, and other types of plumbing systems. If a pipe exists below the surface we can find it. All you have to do is call us to schedule plumbing services in Queens or any of our nearby service areas throughout New York. If you are interested in an estimate for frozen pipe thawing in Queens or the surrounding areas, please call 866-763-5302 or complete our online request form.